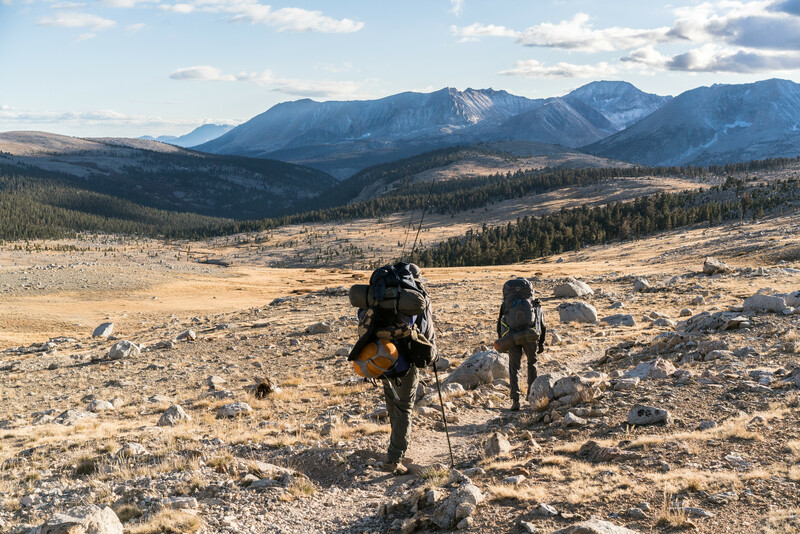 A thru-hike is logistically complicated. Luckily, we had two cars on our trip, so we placed a car at both the starting and ending trailhead. 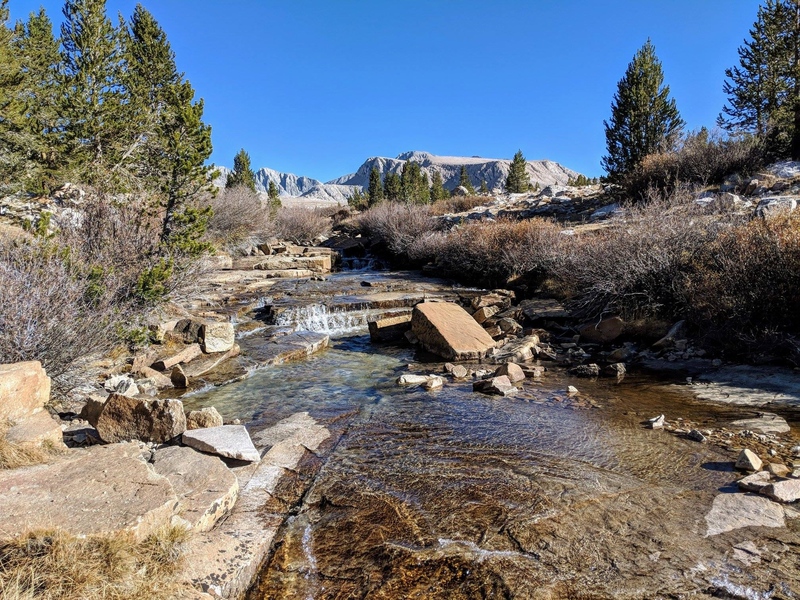 It took a few hours to place the getaway car at Whitney Portal then drive to Onion Valley for our departure on the trail. 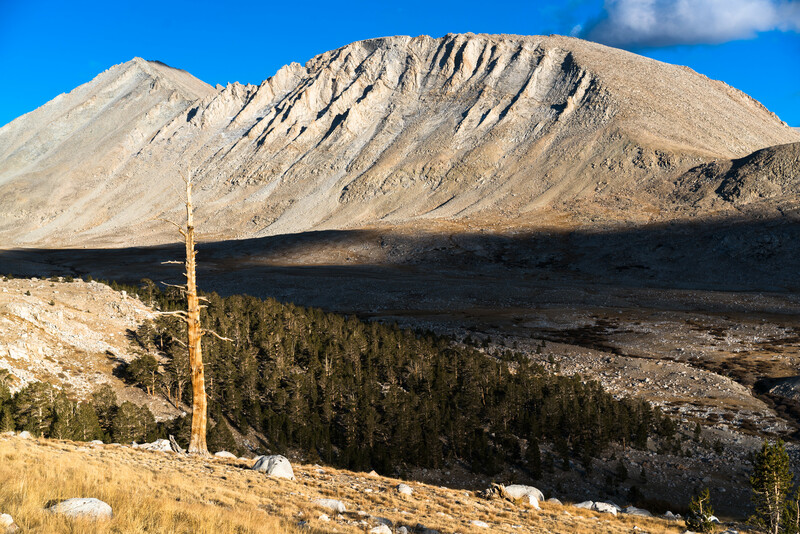 This time of year the days are only light for about 12 hours, and in the alpine zone, mountain shadows linger for hours after sunrise and before sunset. We started our journey on foot at 2 pm, much later than intended. We only had 5 hours of light left. 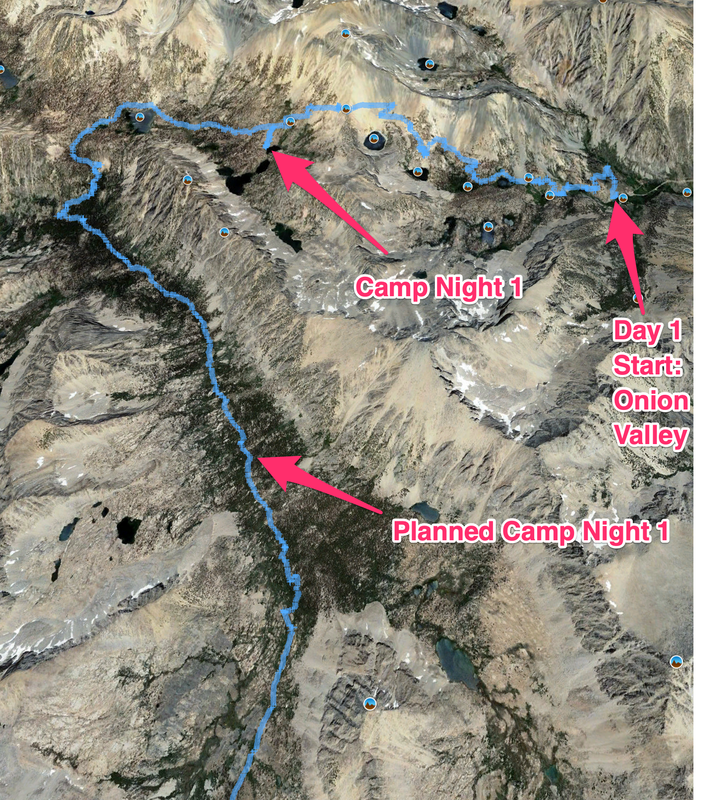 Our goal was to hike 10.6 miles to a camp in upper Kings Canyon. 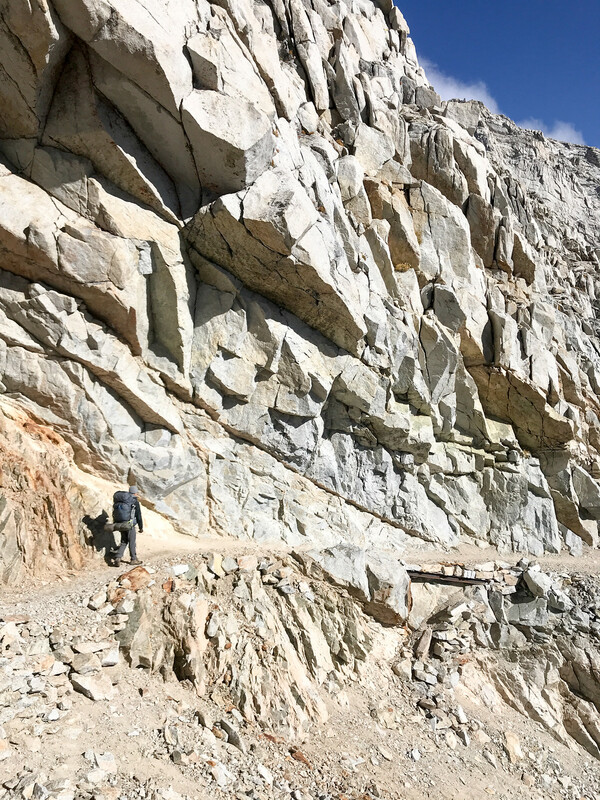 The first 3.8 miles were all uphill, rising nearly 3000 ft to the first major foot pass of our journey, Kearsarge pass at 11,800'. It was warm, 50 degrees, there was no wind. We had all our layers off to avoid sweating. Fall colors were in full peak at 10,000ft. Soon we'd be in those clouds above. 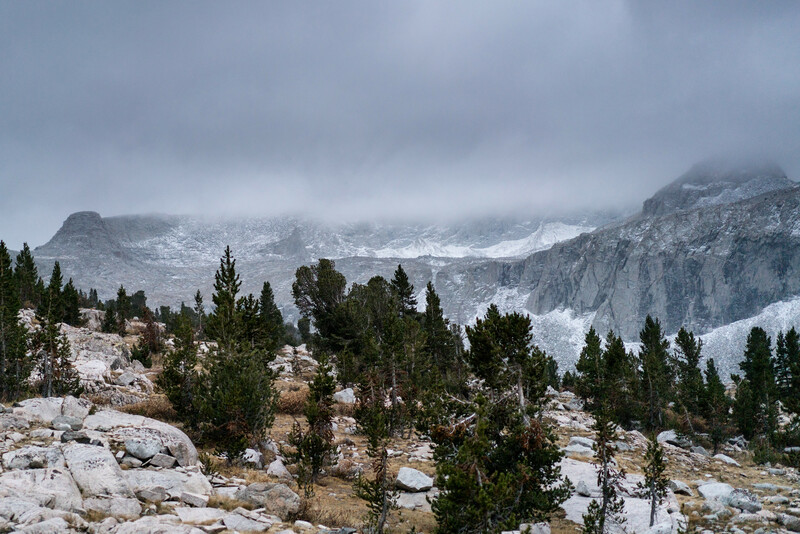 Sure enough, the weather got spooky in the clouds at 11,000ft on Kearsarge Pass. We lost the sun behind the mountains around 5:30pm. And it was so so cold. A steady breeze chilled our bones. 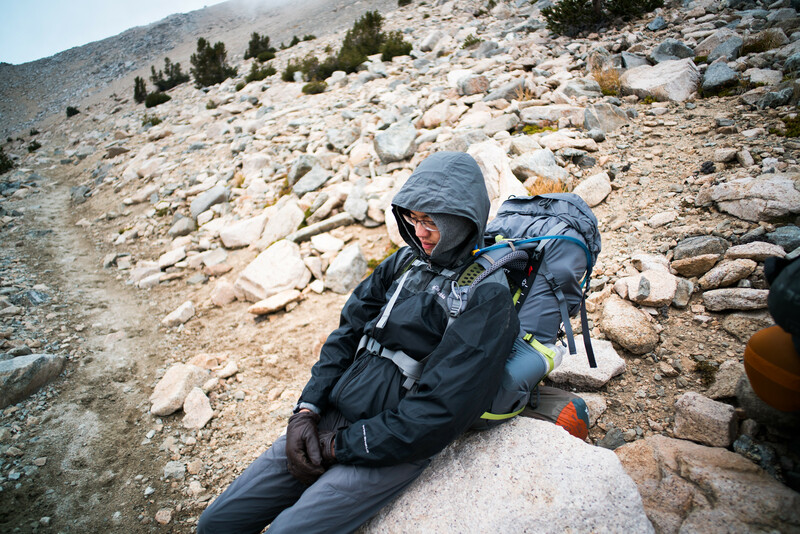 We layered up with insulated jackets and shells to break the wind. @xelanil was tired. We all were. Having been a sea level for weeks before, the elevation beat us. It was a slow slog to the top of the pass. I saw stoked, but shivering. We hiked into the night for an hour. And stopped 5 miles short of our planned camping spot. We woke up to a sunny but chilly morning with 20 mph winds. 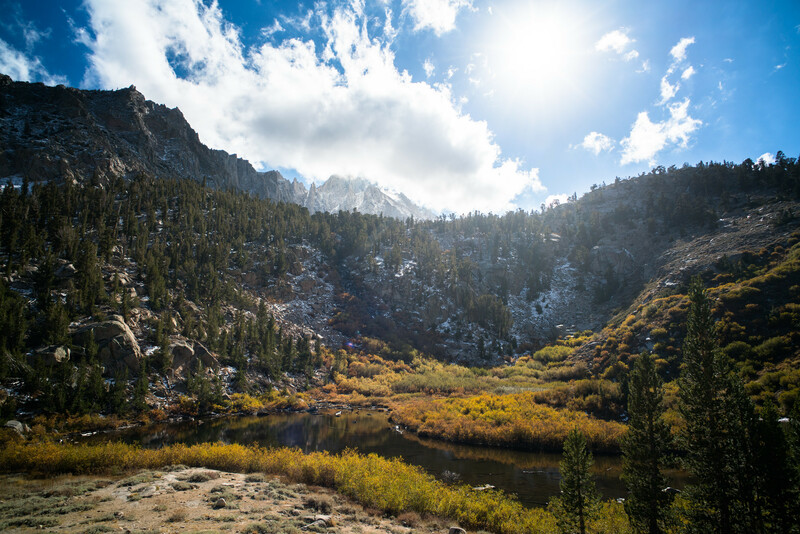 The view of Kearsarge lake from our camping sport was incredible. We got on the trail at 11 am, undesirably late. But we were so cold in the morning, it was hard to get out of our sleeping bags until direct sunlight hit camp at 9 am. Photo by @xelanil. I'm not a morning person, and didn't want to wake up to get this epic photo. We dropped down into the upper south fork Kings Canyon, about 15 miles upstream of the nearest road in the park. It was epic. This massive canyon bigger than Yosemite Valley had merely one trail running through it. This was desolation. We were still so beat by the elevation. The goal for Day 2 was to catch up on miles by making it over the Forester pass, but a storm was rolling in and daylight was quickly running out. 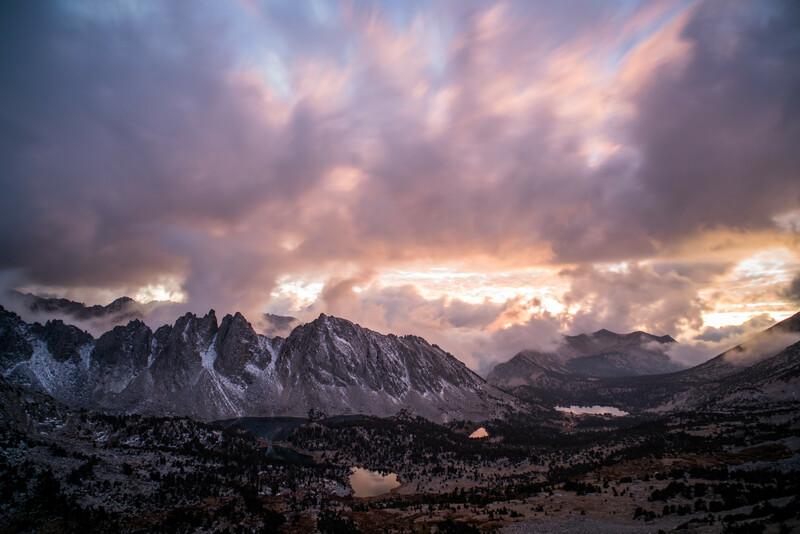 Forester Pass sits in the storm clouds of the photo below. Forester Pass stands at 13,200 ft, far above the tree line. 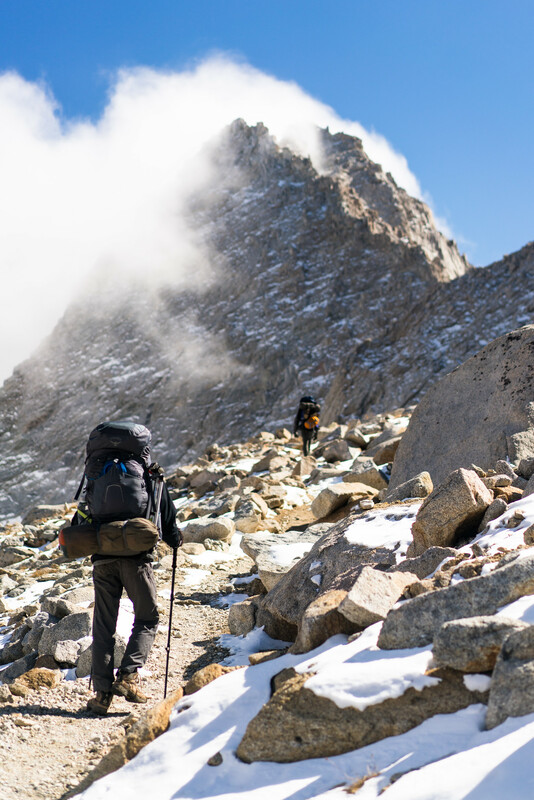 A storm at this altitude could be deadly, especially with negative nightly temperatures. We decided to wait out the storm. We setup camp a few miles from the top of the pass and hoped the clouds would break in the morning. 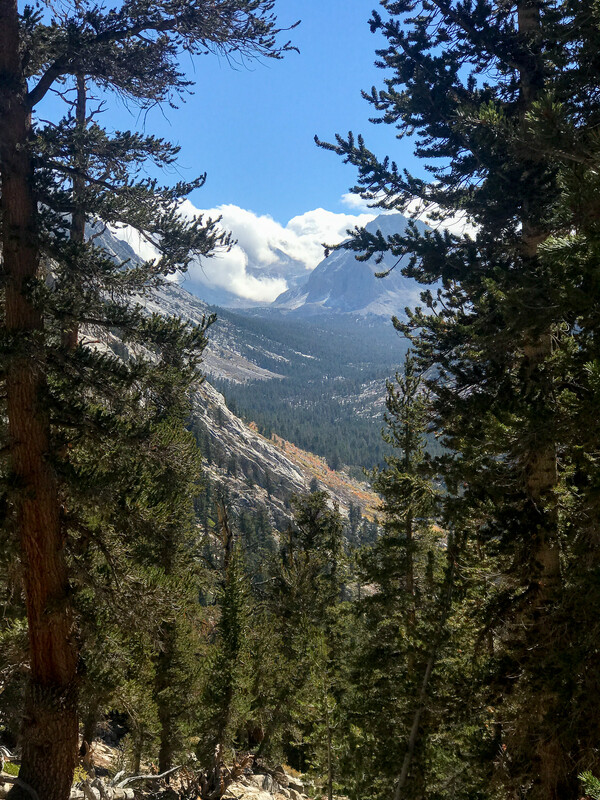 Here's the view down Kings Canyon from camp. It was a cold night. Here's looking up at Forester. We got a light dusting of snow. Dinner time as snow starts falling. 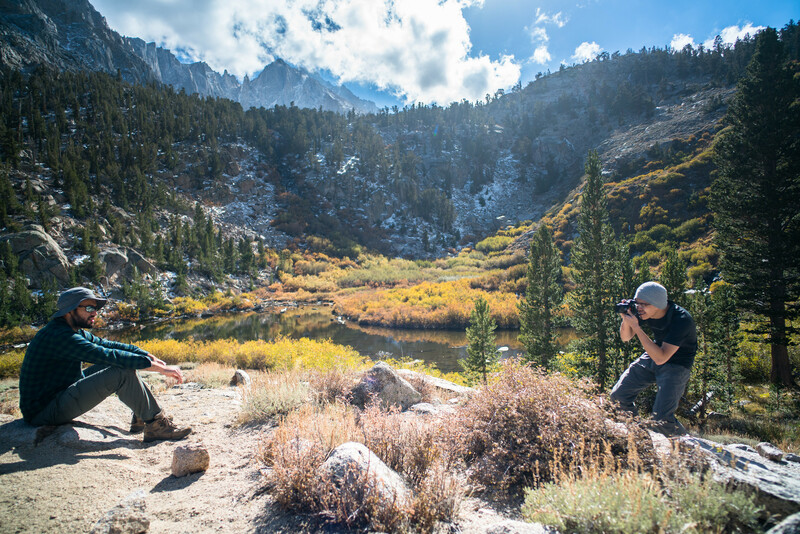 These photographs of your journey are epic!!! I would LOVE to be a part of a journey such as this, now that I'm older and can truly appreciate things more. Alex's thermometer read a hair less than 30F. A cold front was rolling in. We were only 11.7 miles in. And we had 3 more days to finish the 43 mile journey. We had 72% the distance left even though we spent about 60% of our time already. 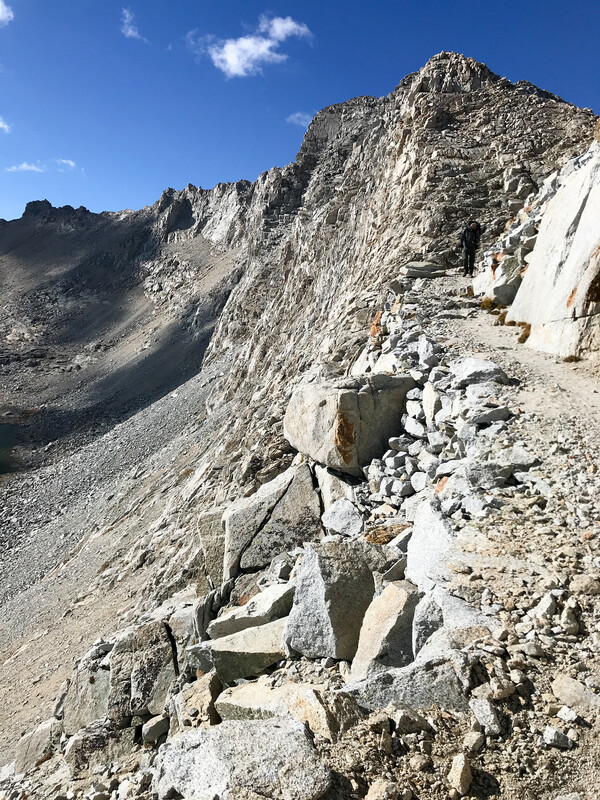 The remaining trail had two major obstacles, Forester and Trail Crest Passes, both dwarf Kearsarge Pass at over 13,000 ft.
We had to make up some serious miles on Day 3 if we were going to complete the journey on time. We got an earlier start on the trail. 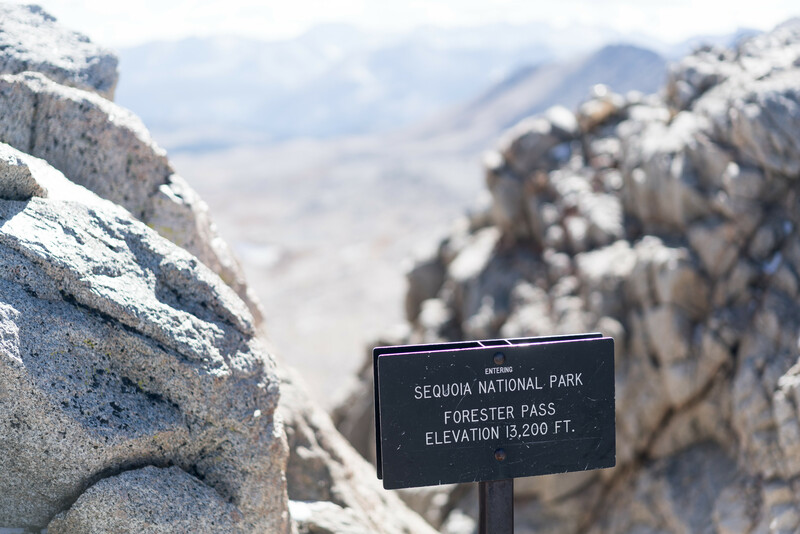 The first half of the day was spent climbing Forester pass. We had to constantly stop to add and remove layers to regulate our body temperatures. We didn't want to sweat in freezing temperatures to fear of the sweat freezing to our bodies. We were stoked we were making good progress. The landscape looked like the Himalayas. We made it to the top of Forester Pass around 2 pm. 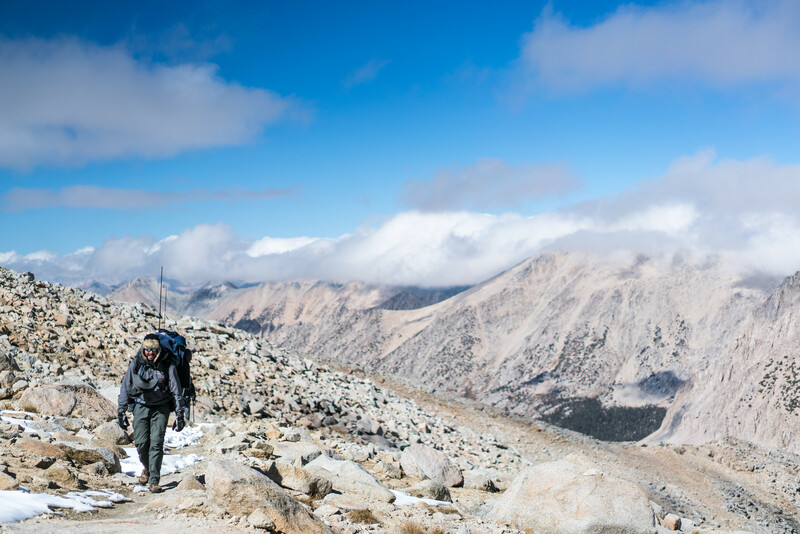 The crossing from Kings Canyon to Sequoia National Park was epic. The trail did not disappoint. It was etched out of a 1000ft cliff. We cruised through the first valley of Sequoia National Park. It was absolutely beautiful. But so so cold, even on a sunny day. 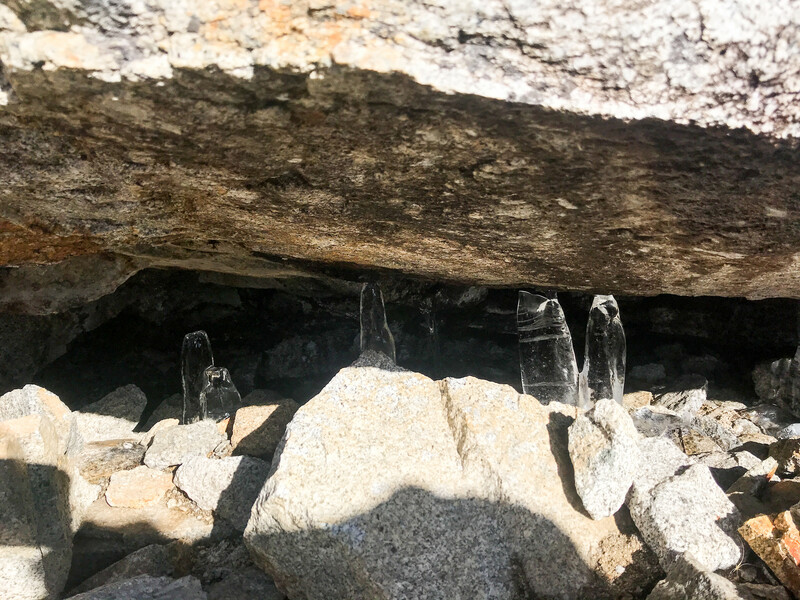 Icicles had formed between rocks, and not even direct sunlight at 12,000ft could melt them. We made it to an ancient forest at near sunset. I'd never seen anything like it. 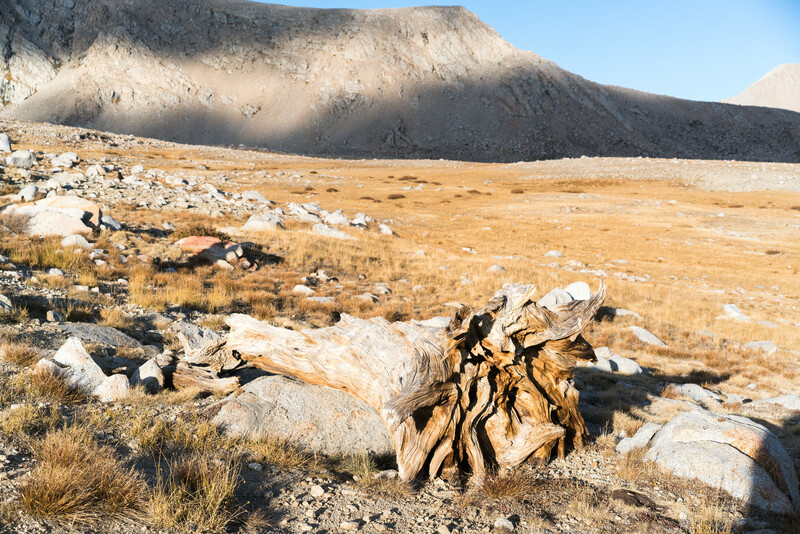 These were huge 2000-year-old trees thriving at 11,000 ft where the air is thin and most trees can't grow. That day we made it to the 20.0 miles mark. That meant we had 23 miles left in the last 2 of 5 days. Days were too cold and too short to get more than a few hours of hiking in. Our packs were heavy. And we were not acclimatized properly. It was clear we couldn't finish the journey on time without killing ourselves. We had enough food to draw out our trip, but we told our loved ones back at home to call the ranger station if we didn't report back to them by 11 pm on Day 5. 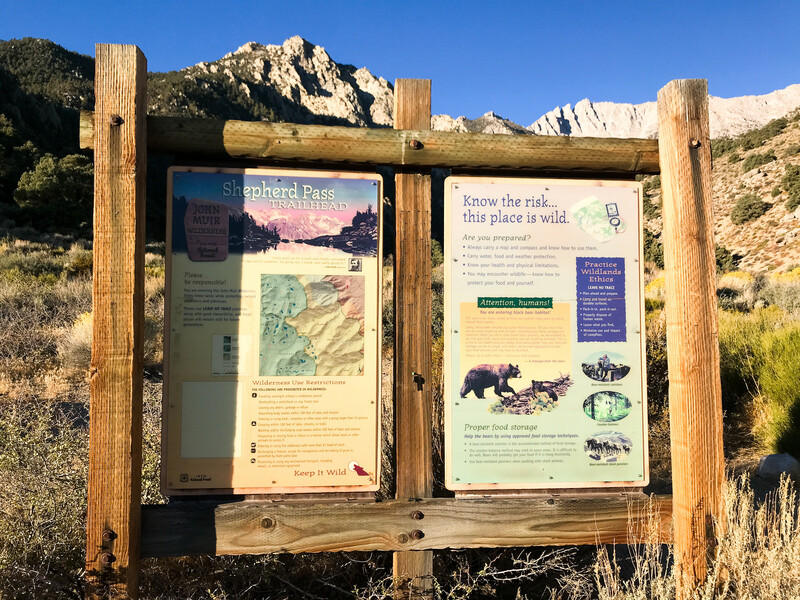 There is a pass that exits to a trailhead halfway between Whitney Portal and Onion Valley called Shepherd Pass. It was 14.5 miles from our camp to the trailhead of Shepherd pass. 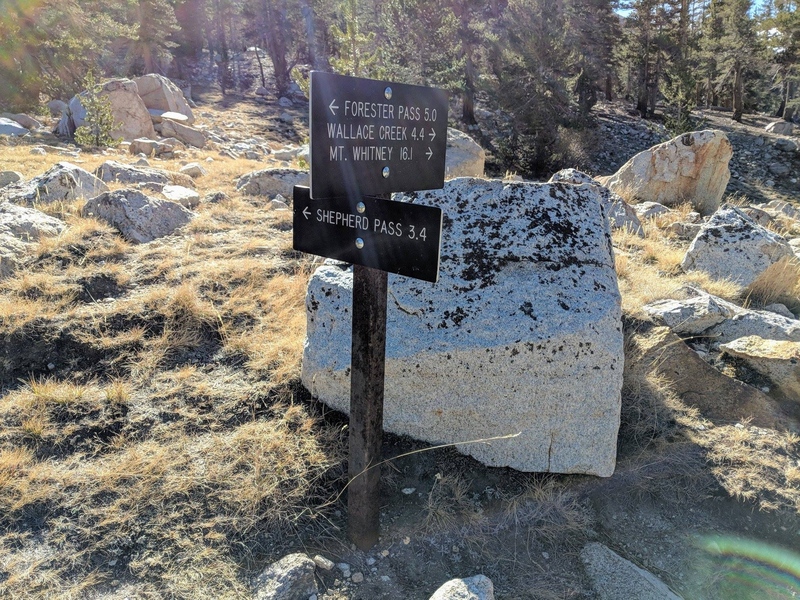 It was much closer than any other trailhead, and only have 2000 ft of climbing as opposed to 5000 ft of climbing if we turned around or continued to the Whitney portal. 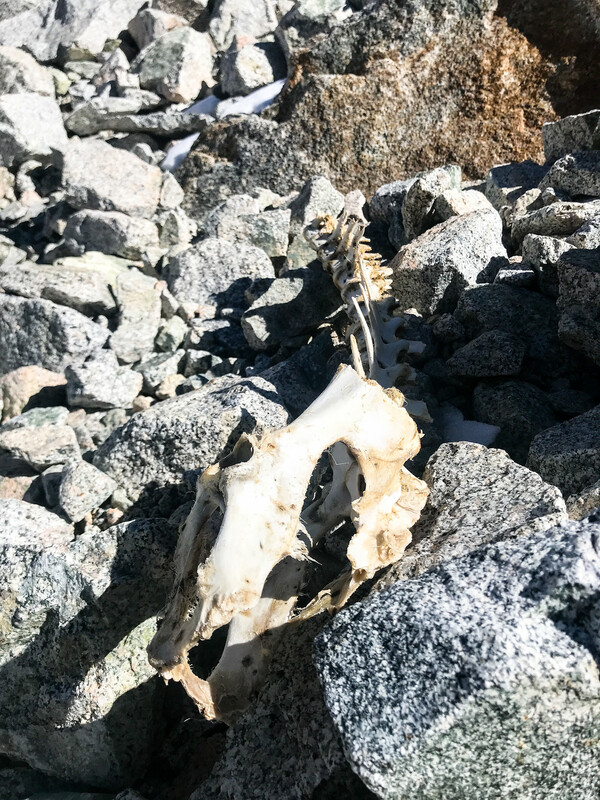 The Shepherd pass had three downsides. 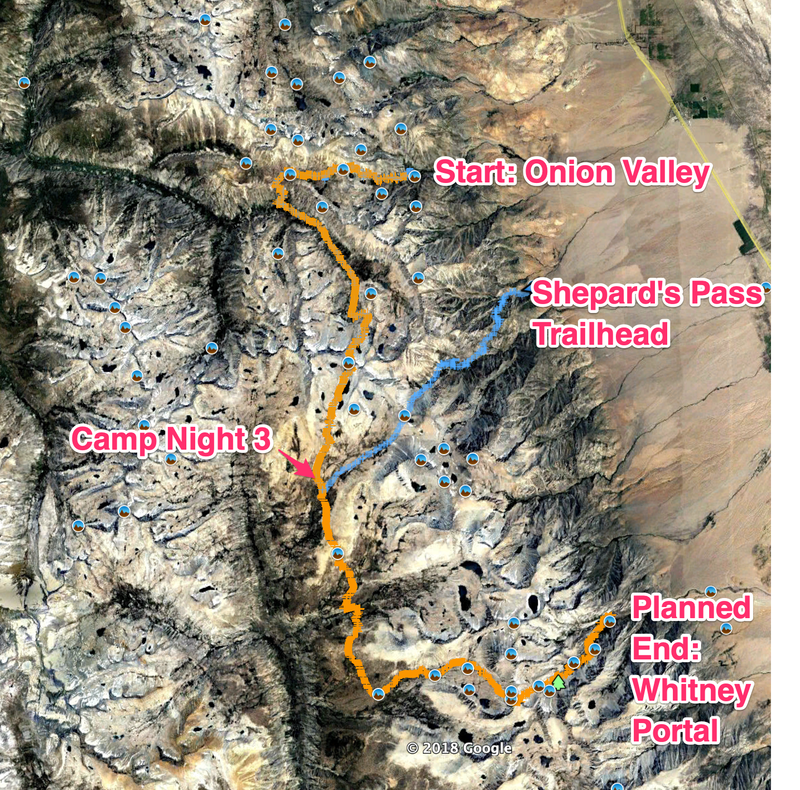 First, we would have to arrange a ride to one of our cars from the Shepherd pass trailhead. Second, the map said "Stock not recommended" which meant it could be really steep and dangerous. And third, it was 7000 ft of vertical descent. This is an extreme amount that would put a lot of stress on our joints. Our group of three made the unanimous vote to exit Shepherd Pass the next day. That morning I filled my camelback with water from a flowing river nearby, added my Aquamira treatment drops, then waited the specified 20 minutes before drinking. To my surprise, the 2 liters of water was nearly frozen solid. This cemented our decision to exit Shepherd pass. 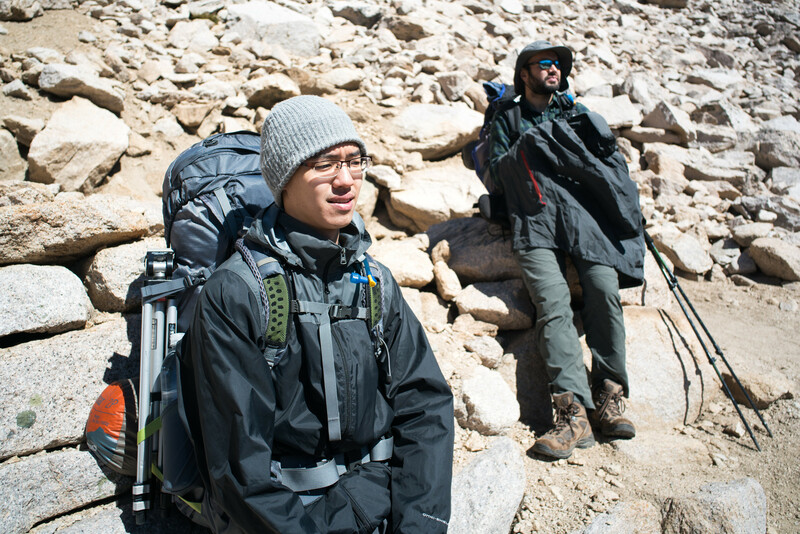 Despite the fact that our camp was fairly low compared to the average altitudes we were at hiking at, it was extremely cold that night. At 8 am, our thermometers read 5F. That's at 10,500 ft, our lowest campsite, in the sun. 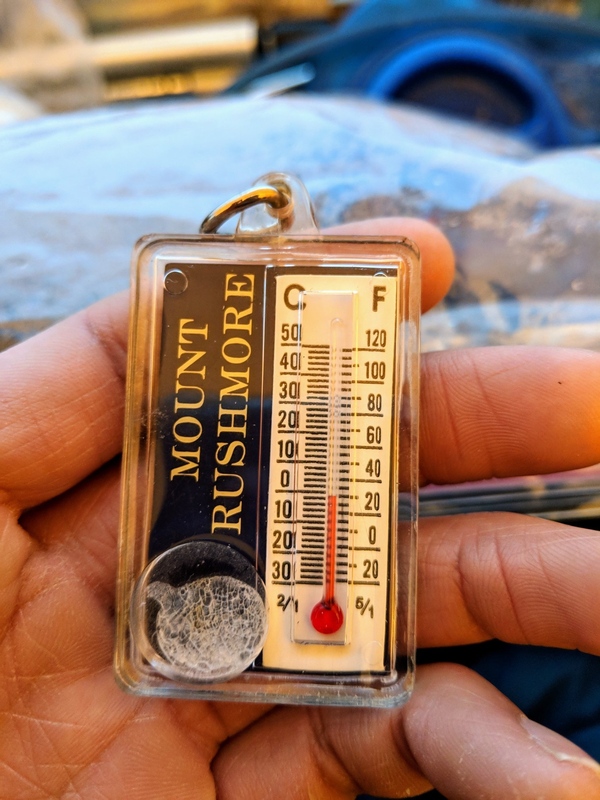 That meant the temp could have been below 0F before dawn. It was absolutely beautiful that morning. The storm days before and the cold front that followed cleared out all the smog and dust. The sky was a perfect blue. 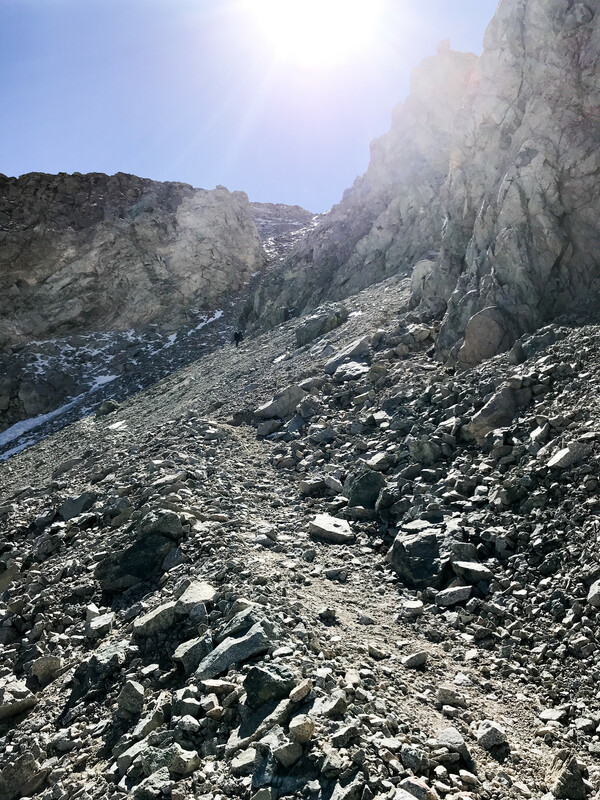 Our fears of Shepherd pass were realized when we dropped into a chute that consisted of a loose talus field. Snow on the trail made navigating the steep terrain quite dangerous. 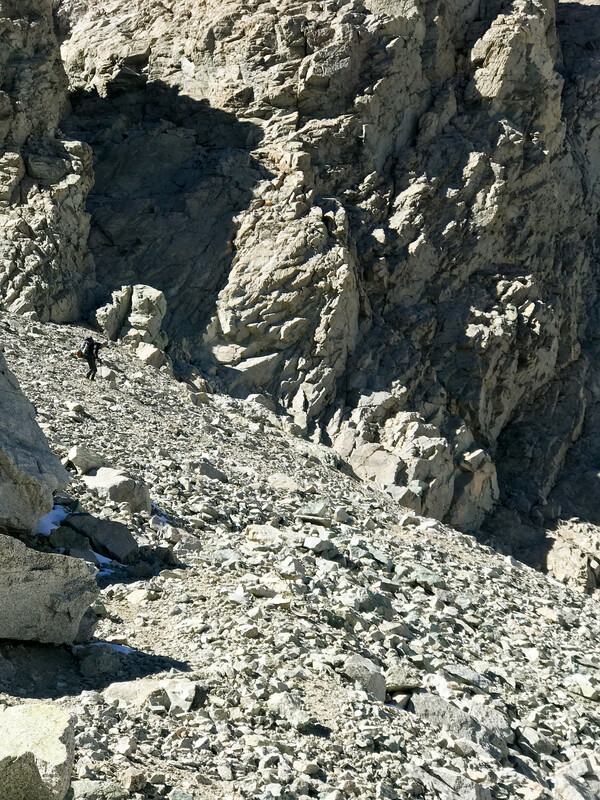 By my estimates, the terrain was YDS Class 3, possibly Class 4 at the top. A class 4 fall is usually fatal. We had to be extremely careful. To our surprise, the chute was littered with elk body parts. Maybe 50 elk died in this chute. My theory was an avalanche took out a heard in the winter before, and the snow had finished melting this September-October. Fresh coyote poop filled the trail. 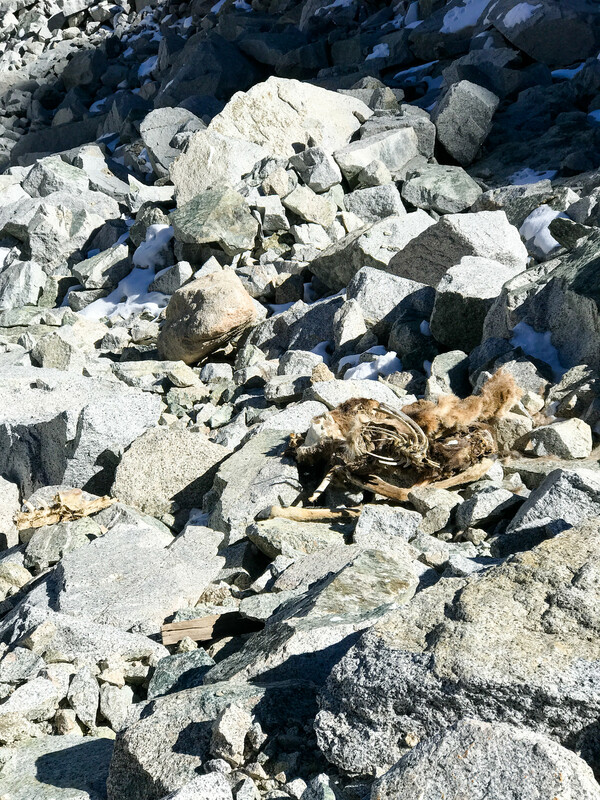 Coyotes must have ravaged the recently unfrozen dead Elk bodies. It was a relief to finish the steep terrain. 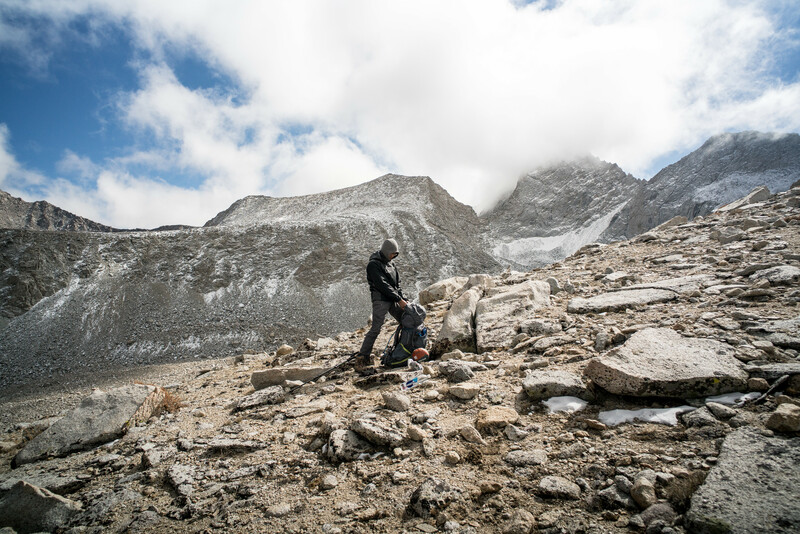 We spend the next five hours descending the remaining 6000 ft via hundreds of switchbacks. Although we had another day left, there was not a single suitable area to camp in the remaining 10 miles. 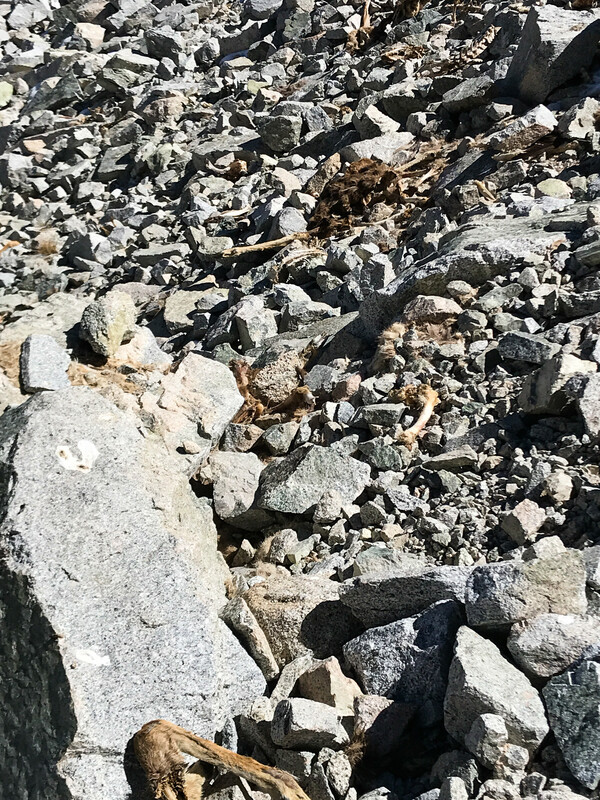 The trail was 1 foot wide at most and on a 60-degree mountainside the whole way down. We made it to the 6000ft trailhead around 8 pm. 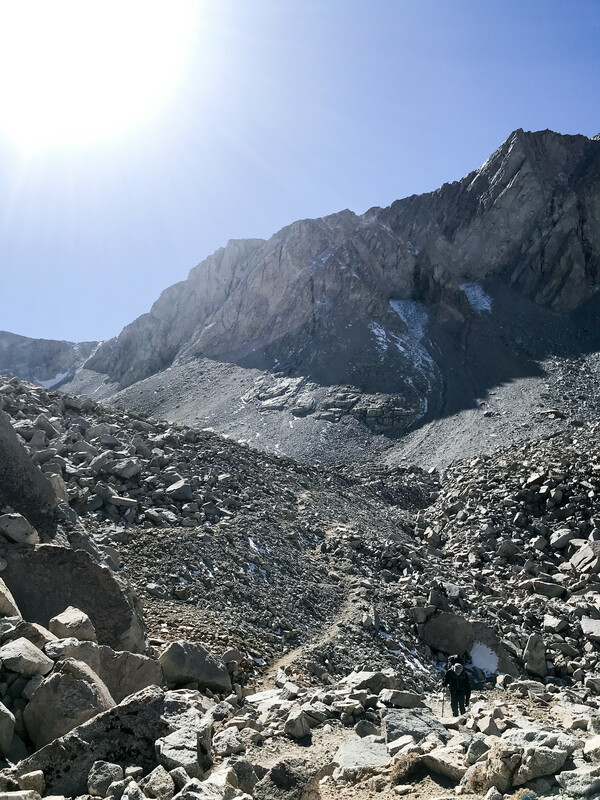 We were 45 minutes by car from our closet vehicle in Onion Valley. The last few miles to the trailhead was a 4x4 road. Getting a ride was impossible at this hour where no taxi service operates. 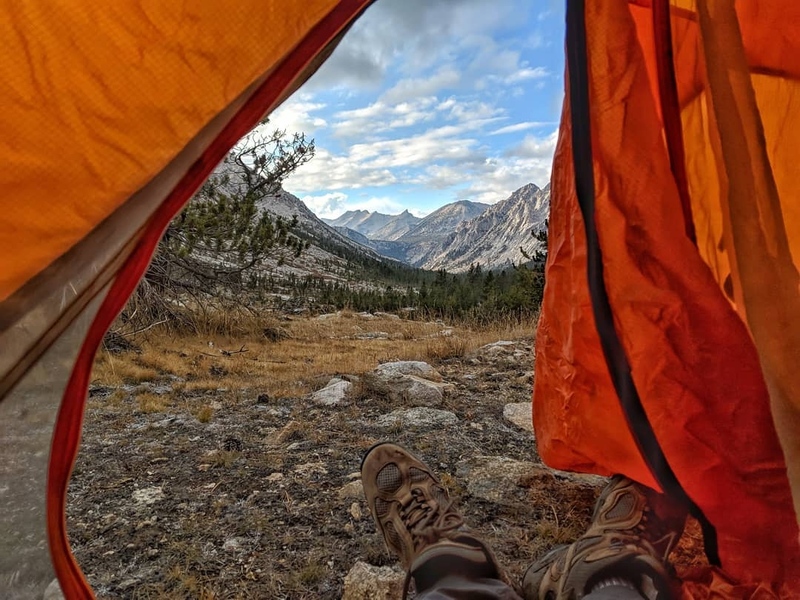 We had 5 days of food and fuel, so camping at the trailhead on Day 4 was comfortable, especially because the trailhead was much warmer than our last camp, about 4500ft higher in altitude. 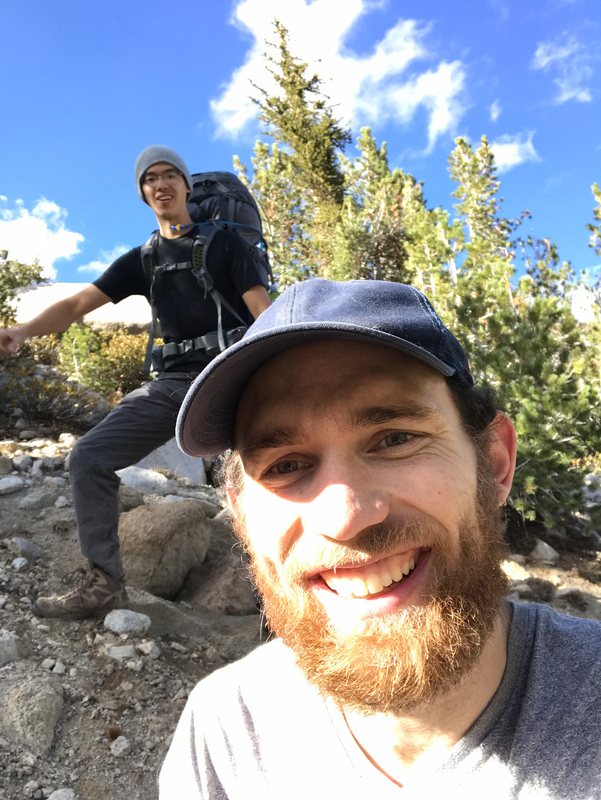 We found a guy listed on the US forest service website that provides hiker transportation. $70 got us a ride from Shepherd pass trailhead to Onion Valley. From there we collected the other car at Whitney Portal. It was a remarkable trip. We went 48 hours without a single another person, and we saw 5 other people on our whole journey. We found solitude. i trek out of lodgepole campground a lot, it is a hike out from there over panther pass, i usually head towards lion lake past tamarack, and on to triple divide peak. 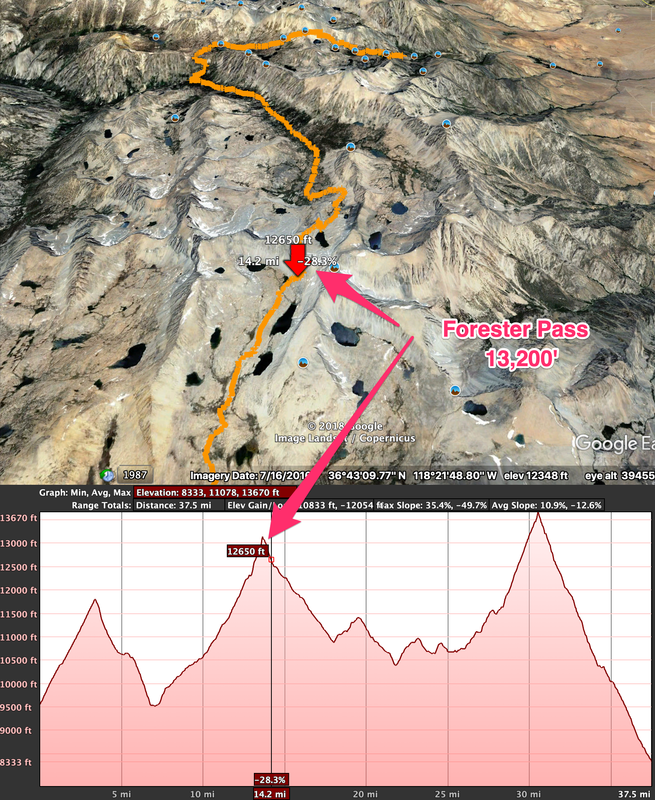 nice work on getting forester pass, thats a LOT of work due to the elevation, most people will never see that ! yeah snow, lol nothing like a little walk through the park. 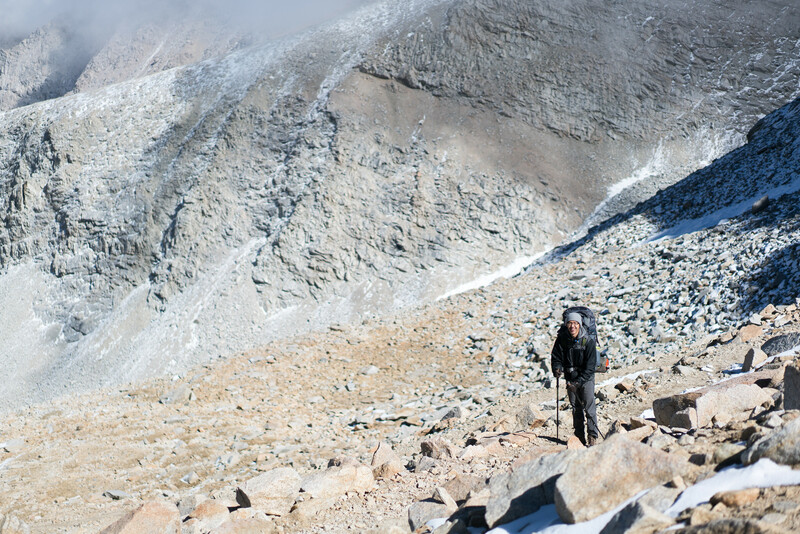 but i'm certain you can lose at least 20 pounds off your pack and still be fine, the lost weight would mean the world in terms of lugging it over 13K+ peaks. Nice gear list! This inspires me to get rid of some of my heavier stuff. 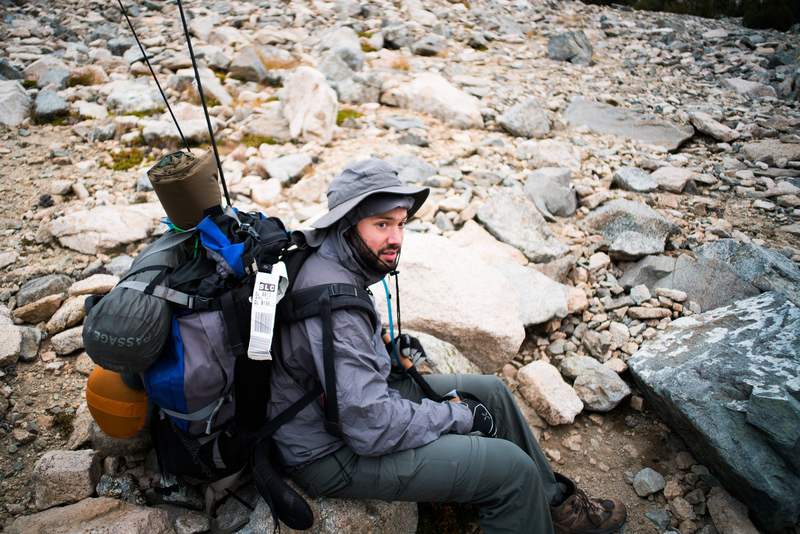 Yeah, 50lb pack and worn weight was killer, especially on my 155 lb frame. 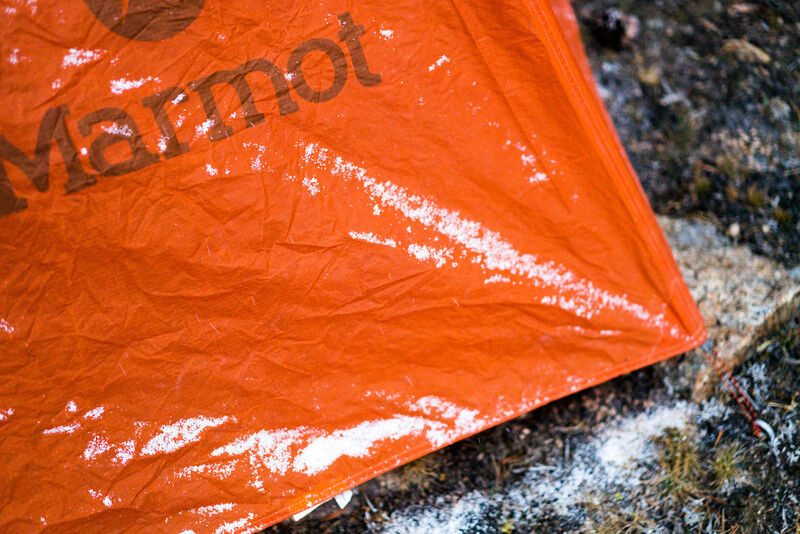 I'm glad I brought 2 sleeping bags for the 0-degree night and a 3 season tent. In the summer, my weight with food is usually in the 30 lbs range. 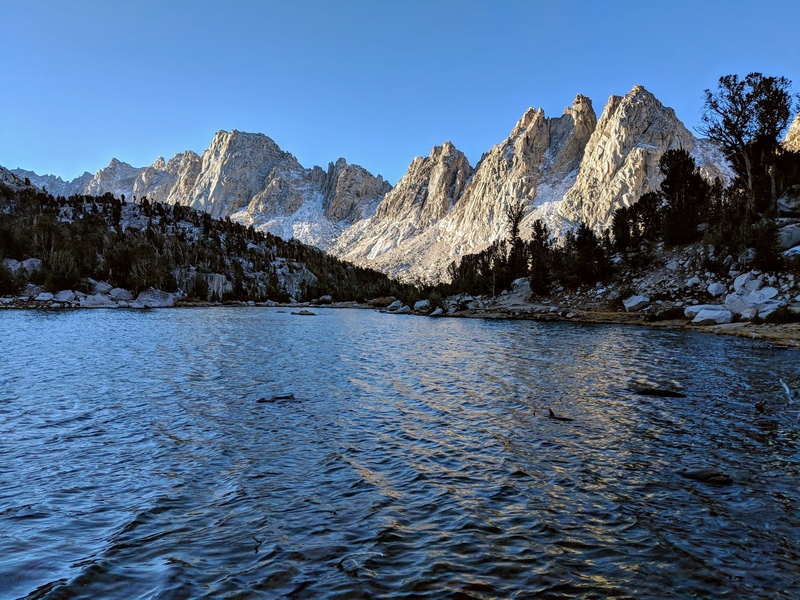 Having starred at the epic peaks of the western side of the Kern river drainage I think my next trip will be to your area. 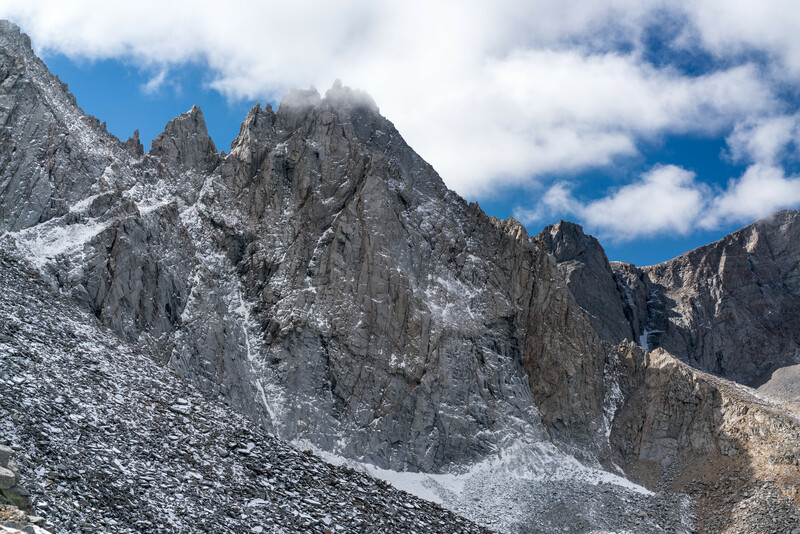 I just can't get over how beautiful the triple divide ridge line is. And it's a shorter drive to those trailheads since I live in San Jose. 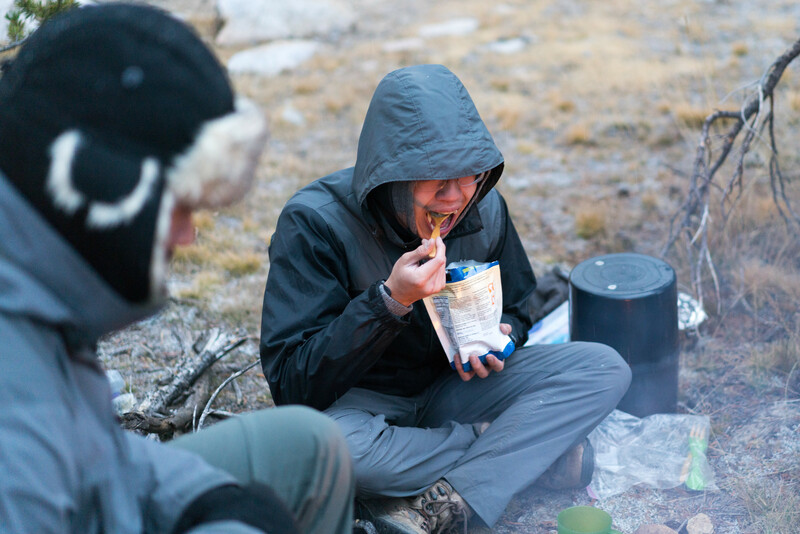 i always bring a north face down 0 degree bag, when it's as cold on a trip as yours, i'd wrap it with a bivy and be sleeping in my clothes most likely. dual purposing equipment is one of the best ways to shed weight, along with dropping heavy items ... i have a simple rule, each time i return i evaluate every item i didn't touch the entire trip and ask if its essential. from there i categorize by season, and sometimes i've been cold (not life threatening, but definitely miserable). as i've aged, i've become accustomed to bringing an extra jacket, but most times its a security blanket rather than a necessity. but as you well mention, it only takes one mistake to truly mess things up. Beautiful photo. I absolutely love travel, and I am so excited for what Cake can do to help compartmentalize the travel discussions. Lots of possibilities here that don't exist in other social channels, and I can't wait to see where the conversation goes! Great progress thread/posts like these are why I would like to be able to stop any comments on a post until the story is done to allow for a really nice transition in the day to day posts. Then the comments and questions happen. Doesn't work for all posts and stories as some want interaction between posts but a good option to have. I don't see a way to do that. Thanks upon thanks from an over-the-hill Appalachian Trail hiker. Absolutely incredible post as an introduction to CAKE! GREAT WORK!! Great read. That first photo is insane. I need all the reactions for that 😮. Thank you 🙏 It’s a dream of mine to hike something as grand as the Appalachian Trail! 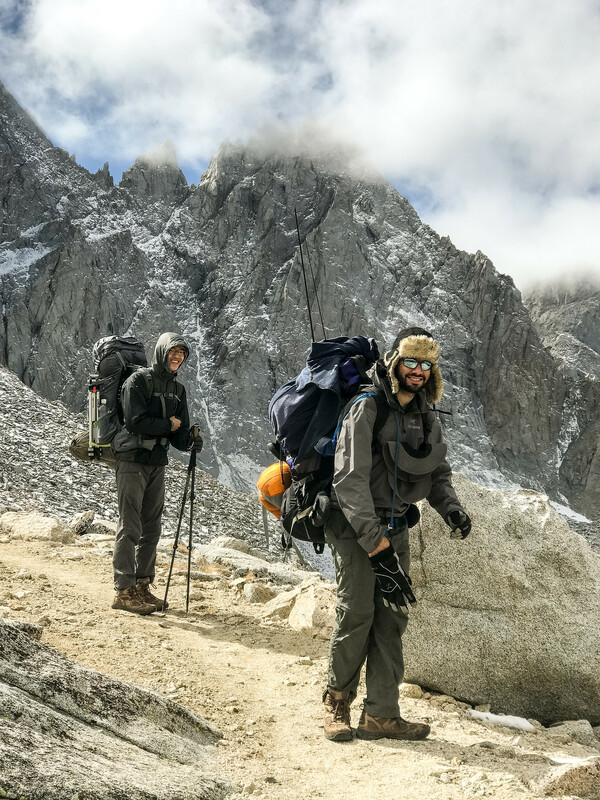 Wish I could have joined, I have always wanted to backpack deep into the Sequoia back country. 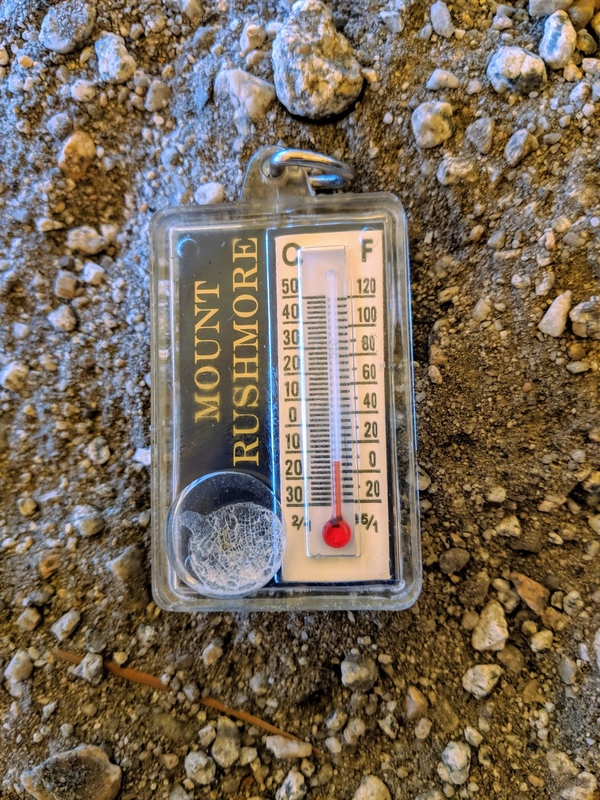 It seems to me that every time I venture into the Sierra's the weather is never as expected and always seems to be a lot colder than forecasted. 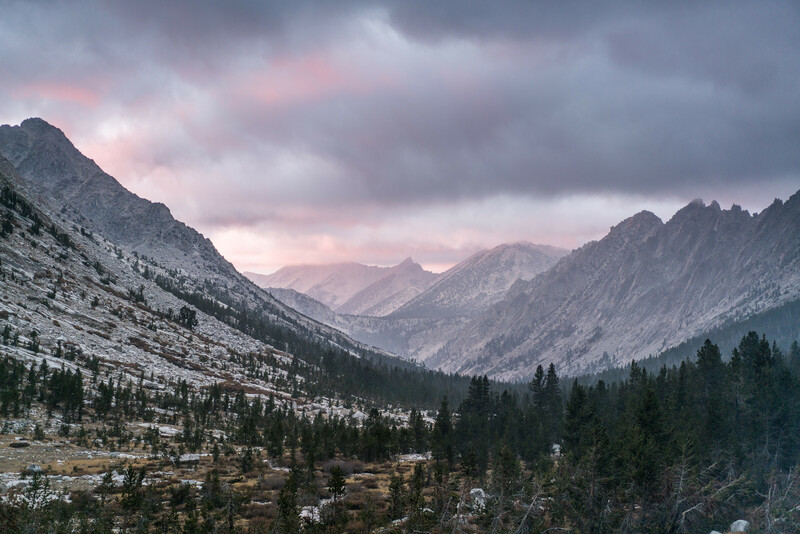 But I find this to be one of the most alluring parts of the Sierra's. 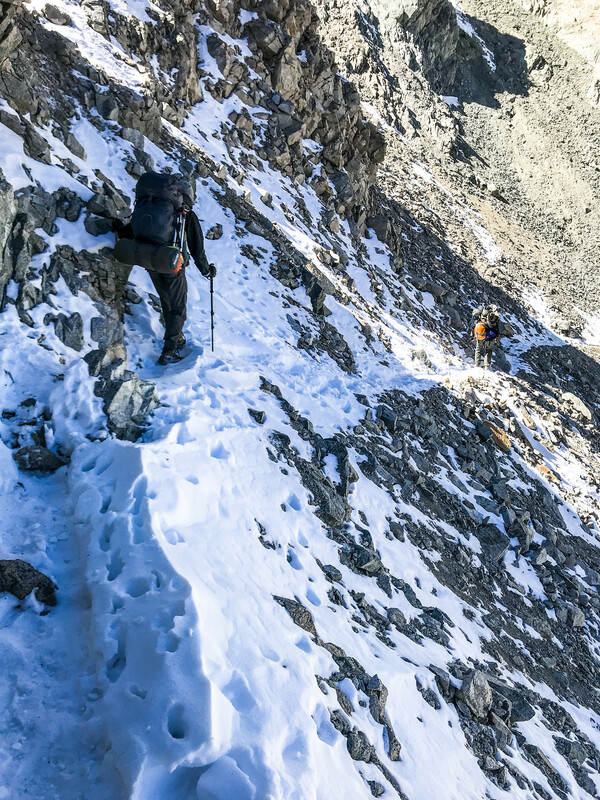 The fact that due to the ever changing circumstances and conditions in the Sierra's makes it so that not every person and not everyday you can make it to the summit, over a pass, or to the campsite. And the times that you don't make it make for the greatest adventures and stories. These so called 'unsuccessful' adventures make the successful ones ever more sweet. 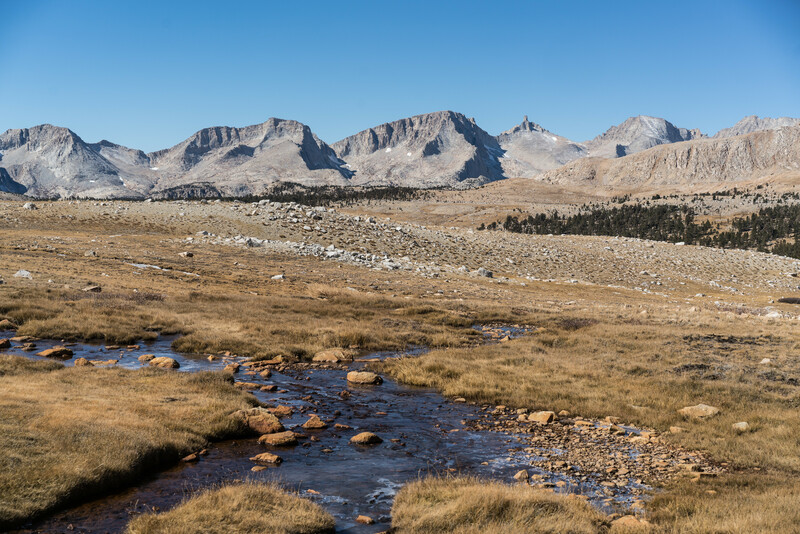 There is nowhere like the Sierra of California in North America. It has a special place in my heart. It's the only region of vast uninterrupted alpine land. 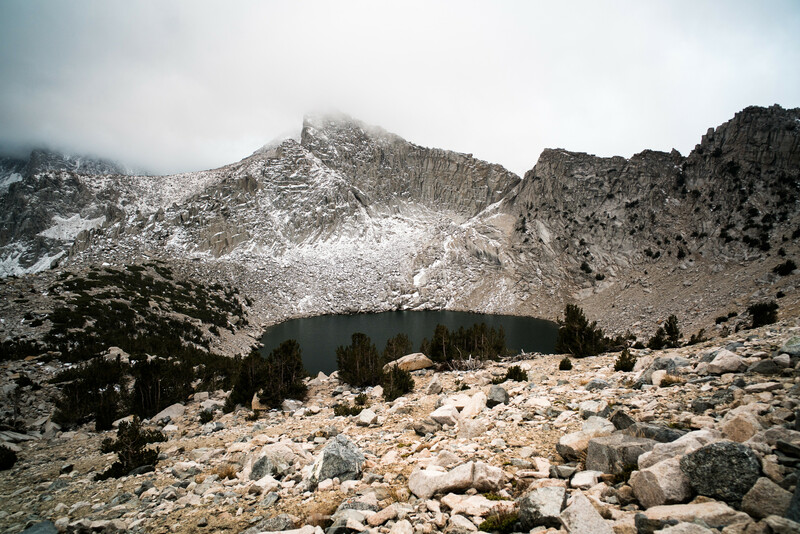 There are thousands of square miles of lakes and plateaus above the treeline. Other ranges, like the Rockies, have many tall peaks but not as much concentrated high country. @kevin coming back to look at these great images. I had that same thought. If you could start a conversation as a panel and then later change it to a normal conversation so everyone else could comment, I think that could be a useful feature. Thanks! Had to come back to look at the photos myself. I miss the adventure already. I forgot to share this photo @xelanil shot. It's our mountain shadow as we descended from Shepherd Pass on the last night.